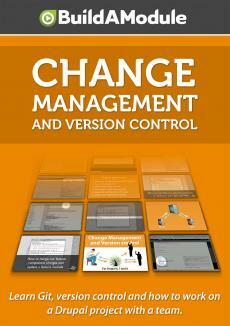 Welcome to Change Management and Version Control. Of all the series that we've done on BuildaModule dot com, I'm particularly excited about this one and let me tell you why. First of all, the techniques that we'll cover in this series are applicable to most versions of Drupal. You'll be able to apply this to Drupal 6 and 7 and a lot of these concepts will apply to 8 as it rolls out as well. Also, the concepts and techniques that we'll cover are scalable. Not only will they help you if you're a single individual working on your own project, deploying your own project, they'll also help you work on a large team with a complicated workflow that involves many steps in order to get to a production site. And at every level, it will save you time, it will improve the stability of your code and the maintainability of your code as well. The set of tools that we'll be covering in this series are considered some of the most powerful tools available for managing a Drupal workflow. And along with that power comes a level of complexity because a number of concepts are introduced that you may not be familiar with and that may seem a little bit difficult to wrap your mind around initially. But what's nice about the way that these concepts are introduced in this series is that they couple a very practical implementation of each concept. So you'll learn something new and you get to see it in action and you'll get to practice it yourself. And by the end, a lot of these concepts will just be second nature to you because you will know how they work in the real world. In the first part of this series, we're going to be exploring a version control system called Git and we're going to apply Git in order to solve some fairly common workflow problems with Drupal. We'll look at how to use Git to maintain our website, to add new changes to our website but still be able to roll back the changes. We'll look at how to create a central remote repository so that multiple people can work on the same code base at the same time and not lose any changes. And we'll also deal with some tricky topics like how to deal with a multiple server workflow where you need to push something from a development server to a staging server to a live server but be selective about the type of code that you're pushing for various releases to your application or your website. Don't worry if you don't know what a production server is or don't know what a branch or a merge is right now. We're going to go through each one of those in detail to make sure that you have a solid idea of not only what they are but how you use them in the real world.